Begonias are a beautiful and diverse group of plants, with more than 1,500 species. Some are suitable for use as bedding plants or in container gardens, some for hanging baskets and others for indoor cultivation. 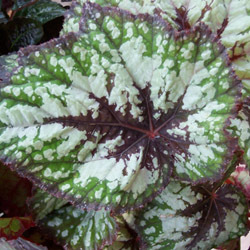 Begonias are treasured not only for their colorful flowers but also for their unique foliage, and many varieties make spectacular houseplants. Begonias require little care when grown indoors. They need plenty of bright light with shading from the intense afternoon sun. Comfortable indoor temperatures are advisable, 65-75 degrees Fahrenheit, and should drop slightly at night, but not below 55 degrees Fahrenheit. Begonias are very sensitive to over watering. Make certain that the soil drains well, the pot has a drainage hole and water is not permitted to stand in the saucer. It is beneficial to provide additional humidity as heating and air conditioning rob indoor air of precious moisture. The best way to increase humidity is to use a humidity tray under your begonias. Avoid misting these plants to prevent mildew on leaves. Provide adequate air circulation to ensure the foliage stays fresh without excessive dampness. Indoor begonias are relatively carefree if they are kept healthy. 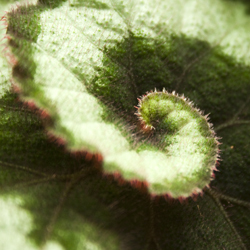 Insects that commonly affect indoor plants may also cause problems for begonias. These include mealybug, whitefly and spider mites. If leaves become crispy around the edges it is an indication that the plant requires more humidity. If the leaves yellow and start to fall off it means the plant is receiving too much water. Fertilize begonias bi-weekly with a balanced fertilizer during the growing season. Stop fertilizing during the winter months to give the plant a rest. If you have any questions about these or any other houseplant problems, please call or stop by our greenhouse and speak with one of our experts. 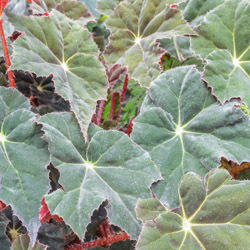 These begonias are favored for their large, colorful, patterned, wing-shaped leaves. The flowers of this begonia are large, hang in clusters and tend to be soft in color. Angel Wings bloom in shades of white, pink, red and orange. Due to their cascading habit, these plants lend themselves well to hanging baskets but also look wonderful in larger pots. You may pinch Angel Wing Begonias to keep them at a manageable size and also to promote new canes at the base of the plant. Hang these plants outside in a semi-shaded area during the summer. Although these begonias do flower, rex begonias are grown primarily for their striking foliage. The leaves are uniquely shaped, unusually patterned, heavily textured and come in exceptional color combinations that can include green, pink, red, silver, yellow, orange, maroon and purple. These are one of the most loved and easy to care for houseplants. The main attraction of this plant is the brilliantly colored, double or semi-double flowers in white, yellow, orange, pink and red. This plant will flower for several months and the flowers will last longer if temperatures are on the cooler side, 55-65 degrees Fahrenheit. Deadhead to encourage new blooms and extend the blooming season.